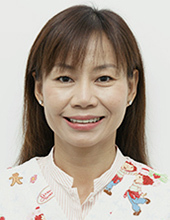 Dr Ja Intarasoot is an accredited Specialist in Paediatric Dentistry. She obtained her Doctor of Dental Surgery (DDS) in 1994 and subsequently underwent specialist training in Paediatric Dentistry at the renowned Eastman Dental Institute and Hospital in London and received her Master’s in Children’s Dentistry in 1998. She is also a Fellow of the Academy of Medicine Singapore. Dr Ja manages Paediatric Dental patients from birth to early teens and has a special interest in managing fearful and medically compromised children, together with specialists from other medical disciplines. Her interests also extend to the field of Paediatric Dental Traumatology. Her scope of management covers chair-side dental treatment through various acclimatization techniques, under Local Anaesthesia, through inhalational sedation or under General Anaesthesia. As at the beginning of 2011, Dr Ja has already successfully carried out and rehabilitated over 3000 cases of severe dental dysfunction under General Anaesthesia alone.